1.3 What is a Console-Based Therapy? 3.1.1 What is a Wii? 3.3.1 What is a Tablet? 5 What is right for you? 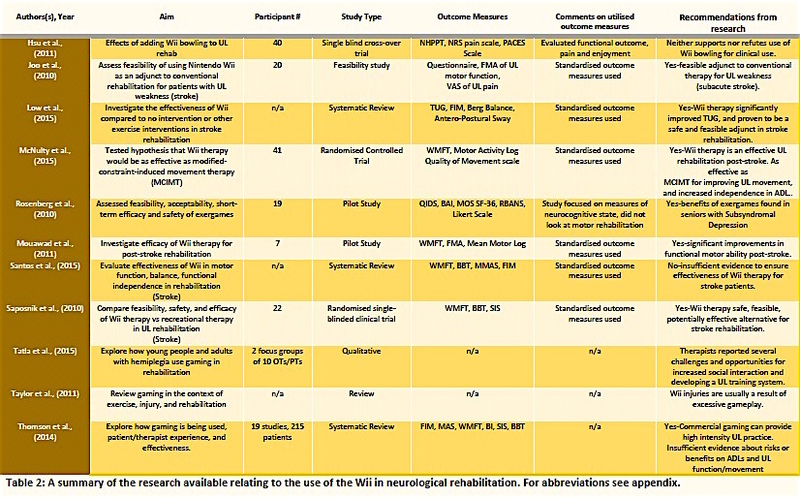 This wiki will examine the use of the Nintendo Wii, the Microsoft Kinect and tablets in the rehabilitation process of neurological patients. This resource is for the use of practicing physiotherapists and may be of benefit to other health care professionals seeking further knowledge in the use of consoles and tablets in neurological rehabilitation. The therapist will be provided with information that explores the rationale behind game-based rehabilitation. The therapist will be introduced to the integration of technology into neurological rehabilitation with the aim of enhancing self-management and the independence to continue home-based therapy. The therapist will be provided an analysis and critical evaluation of the evidence currently available for the use of technology in rehabilitation. The therapist will be provided with an overview of the robustness of prevailing research of technology within gaming therapy. The therapist will have available to them real world availability and application of current technology. The therapist will be able to make an informed decision on the appropriate console and games to use in the rehabilitation of patients with neurological conditions. The Scottish Government predicts an increase in population. The ever increasing population brings with it new challenges for the healthcare system. People are living will illness and disability longer than ever and this places an increasing strain on the healthcare system. The projections predicted for Scotland, state the total population will reach 5.78 million by 2033 with those aged 65 and over with an increase of 62 per cent and those over 85 years of age. 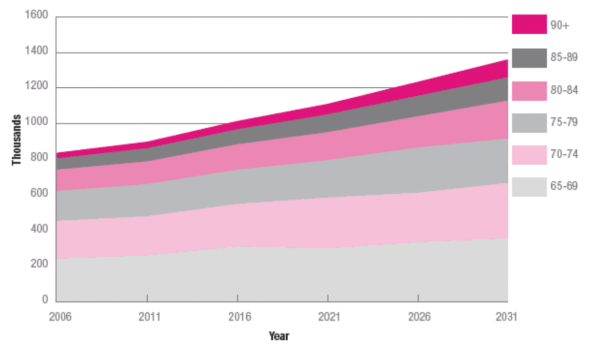 This is reported to increase over 144 per cent between 2006 and 2031 (Figure 1). With the increase in age, the likelihood of encountering a greater number of chronic conditions and comorbidities will increase. This combination will give rise to the number of pharmaceuticals, time, facilities, doctors and therapists required to assist in rehabilitating or managing the plethora of conditions. It is through the 2020 Vision and e-health initiatives that the Scottish government aims to continue to provide quality care to the masses. The demands on the health care system are only going to increase. Additionally, the rate of funding is increasing at a slower rate than the ability to provide quality services, are increasing. This makes it difficult to obtain sufficient funding to allocate into other areas of services without compromising the quality of service elsewhere. Currently the Scottish government has allocated approximately £4.7 million since 2006 towards telehealth initiatives. In theory by incorporating more telehealth into traditional rehabilitation patients with chronic conditions should receive the amount of care required for each specific condition and therapists should be able to manage higher caseloads and manage more patients. The use of consoles to supplement therapy is an economically sound means to increase practice opportunities to patients during non-therapy specific time. There is a lack of infrastructure in place to allow for subsidisation when purchasing consoles or tablets for rehabilitation purposes. Our aim is to draw attention to the potential use of easily accessible and affordable technologies that are available to everyone. Another key element to consider when considering incorporating console based gaming into practice is patient engagement. Research has shown that there is an overall improvement in patient motivation when using consoles and virtual reality for therapy. A study by Deutsch et al  found that individuals had an increase in compliance, playfulness, and endurance and were better able to cope with the repetitive nature of rehabilitation. It has been found that consoles are an appropriate means toassist in the ongoing needs of those requiring neurological rehabilitation of all ages. By using a console as an adjunct to traditional rehabilitation, patients are able to enhance and self direct the pace of their rehabilitation at home. This is vital for any individual with a neurological condition that must live with long term disability. The rehabilitation process may take months to years before the patient is able to function to their full capacity. Therapy may be necessary for the lifetime of the individual if their condition is chronic. With technological and medical advances, individuals who would previously have had a shortened lifespan are surviving longer with a better quality of life. A common issue in rehabilitating neurological conditions is to not only provide sufficient intensity of therapy to regain muscle function and strength of a limb or a joint but also to have transference of skills. A study performed by Deutsch et al. found that the patient population did have some transference of skills when using the Wii as means for rehabilitation. Different games will require different limb activation. Those that require bilateral tasks have been found to improve upper limb function in children with hemiplegic cerebral palsy. It is important that patients not only enjoy partaking in aspects of the rehabilitation process but to also feel they are safe in doing so. Deutsch et al. found that some patient populations require supervision while using the consoles during the rehabilitation process. It was also noted that the patients themselves stated that they felt safe and able to practice within the home setting. What is a Console-Based Therapy? Console-based therapy is the area of research pertaining to the use of technology within the realm of physiotherapy. Whatever the cause of impairment, the main aim of most neurological rehabilitation is to facilitate learning or relearning of motor skills. The process of gaining motor skills involves repeating the same movement hundreds or even thousands of times. Traditional rehabilitation is time consuming and requires lengthy sessions with therapists that place high demand on personnel and healthcare budgets. Patients often tire of rehabilitation, finding it frustrating or dull. It has been reported that patient adherence to long-term rehabilitation programs involving exercise protocols may be as low as 23% . 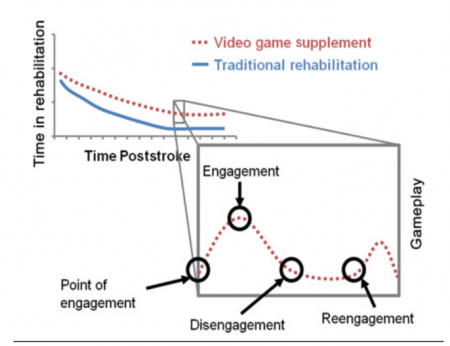 Integrating console based gaming into rehabilitation protocols has the potential to change the current structure of rehabilitation. Used appropriately game based rehabilitation can be challenging, engaging and fun. No longer is a patient repeatedly flexing and extending their elbow, using a computer game they could be taming a lion, stirring cake batter or shooting multi-coloured balloons. Instead of asking a patient to balance while they reach out and touch a physiotherapy assistant’s hand, patients can work on their balance while playing virtual golf, throwing a strike in the virtual bowling alley or driving a go-kart around a race course on a desert island. Console based rehabilitation does not seek to replace therapists with computers; rather it is a useful tool that therapists can use to engage with their patients, make rehabilitation fun and exciting, and has the potential to improve compliance rates and thereby improve the functional outcome of these patients. The section serves as a refresher of some of the conditions seen in neurological rehabilitation and mentioned in this wiki. This will highlight traditional rehabilitation as is currently offered to patients. There are two types of stroke, ischemic and hemorrhagic. The most common type of stroke is an ischemic stroke. It is caused by a blockage of a blood vessel in the brain. Conversely a hemorrhagic stroke is resultant of a burst blood vessel in the brain. Symptoms associated with stroke vary based on where the hemorrhage or block has occurred in the brain. A stroke on the left side of the brain affects the right side of the body and vice versa for a right-sided stroke. Some of the most common symptoms are hemiparesis/hemiplegia (body part depends on where the stroke has occurred in the brain). Altered sensations, slurred speech, aphasia, dysphagia, ataxia, visual field defects, neglect, dyspraxia, memory and personality issues, altered tone, and pain. Some other symptoms are specific to the side in which the stroke has occurred. The majority of the recovery occurs in the first three months and tends to decrease significantly after six months post-stroke. Repetition and specificity of exercises has been shown to be the most effective for recovery. The current NICE guidelines recommend a minimum of 45 minutes, five days a week of focused rehabilitation. The aim of physiotherapy is to restore function and re-educate the body to move in a functional way. Rehabilitation of a stroke patient requires a “more is better” mentality therefore it is up to the patient to do their exercises post physiotherapy, as sessions may be limited. The majority of stroke rehabilitation interventions involve an impairment-based strategy to re-educate movement and allow appropriate compensatory actions. These interventions may include strengthening of the muscles that link movement between the trunk and the extremities in addition to the promotion of functional movements in relation to the link between the trunk and extremities. 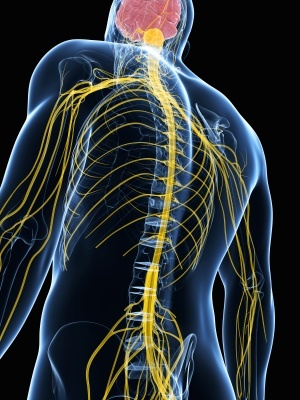 Causes of spinal cord injury are typically traumatic in nature. The traction and compression forces due to a motor vehicle accident, violence, falls, and recreational activities can cause dynamic changes to the spinal cord and the structures surrounding it, resulting in injury to the spinal cord. 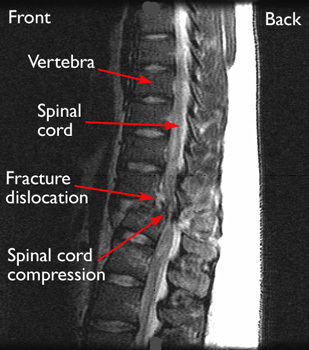 A spinal cord injury can less commonly stem from non-traumatic causes such as congenital or degenerative disorders. The injury can cause damage to the central and potentially to the peripheral nervous system, resulting in variable symptoms. Symptoms depend heavily on the location and severity of the injury. Most recovery occurs during the first six months and like most neurological conditions, the prognosis improves with earlier obtained milestones. One of the main goals of rehabilitation is to prevent secondary impairments including but not limited to respiratory complications, oedema, bowel issues, and pressure sores. More importantly, the aim of rehabilitation is to get the patient as functional as possible in a timely manner. Functional retraining, such as transfer training, wheelchair mobility training and gait training, is combined with strengthening and cardiovascular training to enable the best results for each individual. The focus is on “hierarchy of quality-of-life improvements”, which recognises the importance of target focused rehabilitation that enables independence in basic skills and leads progresses to ambulation. Individualised and specialised programs that are persistent and in cooperation with orthopaedics are essential for best outcomes. Please note not all classifications types are mentioned here. Characterised by high or low muscle tone, muscle weakness, uncontrolled body movement, balance, and coordination problems. These can be manifest either locally or globally and may lead to complications such as respiratory and bowel issues. The main aims of rehabilitation are to prevent further muscle weakness in atrophied muscles, prevent contractures, and improve coordination. Treatment is always individualised because of the plethora of symptoms associated with different classifications of CP. Physiotherapist look for opportunities to facilitate motor learning. Patient centered care should be employed therefore be meaningful to the patient and should have engaging sensory input to facilitate motivation to move. Stabilisation of one part of the body (typically the trunk, shoulders, and hip) may be necessary to enable the extremities to move functionally. It is important exercises are taught to parents in order to facilitate rehabilitation at home. Defined as an insult to the brain caused by an external force that can cause an altered state of consciousness which can be followed by physical, behavioural and cognitive changes. There may also be acquired trauma to the spinal cord (see spinal cord injury) depending on the mechanism of injury. The damage is classified as primary or secondary. Primary damage is indicative of bruising or bleeding on the brain while secondary damage results in reduced oxygenation of the brain. The signs and symptoms differ between primary and secondary damages. Primary damage, may exhibit injury to the cranial nerves with subsequent symptoms due to cranial nerve damaged. Further symptoms depend on the site of injury on the brain. Some deficits that may occur with primary damage include memory loss, difficulty concentration, decrease in attention span, sleep disturbances, headaches and seizures. With secondary damage there may be an increased intracranial pressure due to swelling or hematoma (can cause herniation), cerebral hypoxia or ischemia, intracranial haemorrhage, electrolyte imbalance and acid-base imbalance, infection from open wound, and seizures from pressure. Rehabilitation tends to be based on motor control and learning theories. The rehabilitation requires synergistic organisation, anticipatory and adaptive responses, dynamic pattern theory and new patterns to engage in the motor control theory. It is important to recognise the need for knowledge of results and practice type (slow, simple, and relatively functional) with motor control. There has been evidence in promoting “forced use” therapy in combination with complex movements for improved outcomes. Parkinson’s Disease(PD) is a progressive disorder described as a depletion of dopamine stores in the substantia nigra causing a depigmentation of the substantia nigra along with the presence of Lewy bodies. The cause of PD is unknown but is thought to be multifactorial. It may be influenced by infection, environmental factors grouped with aging, genetics, and a history of depression. Secondary problems such as bronchopneumonia may also arise due to inactivity. Characterised by rigidity, bradykinesia and akinesia, micrography, masked face, postural abnormalities, and a resting tremor. As well as gait changes such as decreased velocity, stride length and foot clearance. With the progression of the disease, the patient will exhibit a festinating gait. There are also implications for deficits in perception, attention and cognition. Autonomic dysfunction and sleep disturbances are also issues faced by PD patients. The general goals of physiotherapy include increasing movement and range of motion in the trunk and extremities, maintaining or improving chest expansion, improving balance reactions, and/or maintaining or restoring functional abilities. Overall, the treatment must focus on preventing secondary impairment and keeping the patient as independent as possible. This may then have positive implications on depression, dementia, and fatigue. Evidence for the use of relaxation techniques have been described to decrease rigidity and tremor. Once relaxation is used, movement must be initiated to promote activity in the most effective manner. Seated class oriented exercise programs have also been shown to be effective. Exercises should be meaningful and mimic activities of daily living to promote functionality in the patient’s life. Therapy should be paired well with medication in order to have a more significant effect. 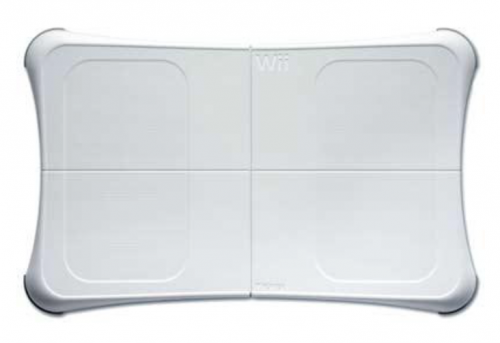 The “Wii” is a computer game console designed to get players moving. The player stands in front of a screen and holds the Wii remote in their hand. A sensor that sits above or below the screen monitors where the player’s hand is (by reading signals sent from the remote in the player’s hand) and translates these signals into movement. It shows the player their progress on the screen. The Wii was designed for able-bodied users, however Joo et al. found that stroke patients with moderately severe UL impairments could operate the Wii with appropriate strapping and supervision. The therapist may be required to provide encouragement and instructions to compensate for the Wii’s usability limitations. 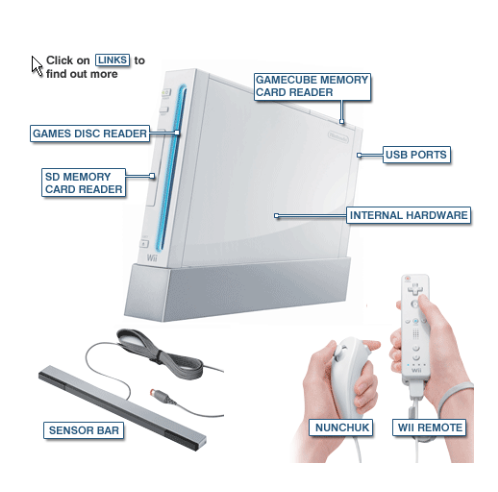 The role of the Nintendo Wii gaming system has grown in patient rehabilitation since its introduction in November 2006 Henry and Barrett 2010. 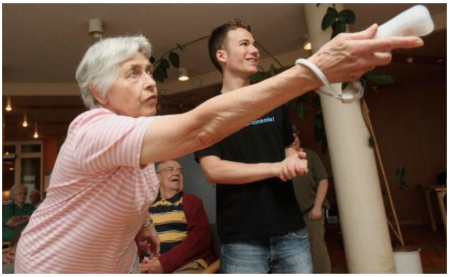 ‘Wii-habilitation’ incorporates the Wii and its components to help patients fulfill rehabilitation goals. Over 75 million units have been sold worldwide, and it is becoming a popular rehabilitation tool around the world Taylor et al. . 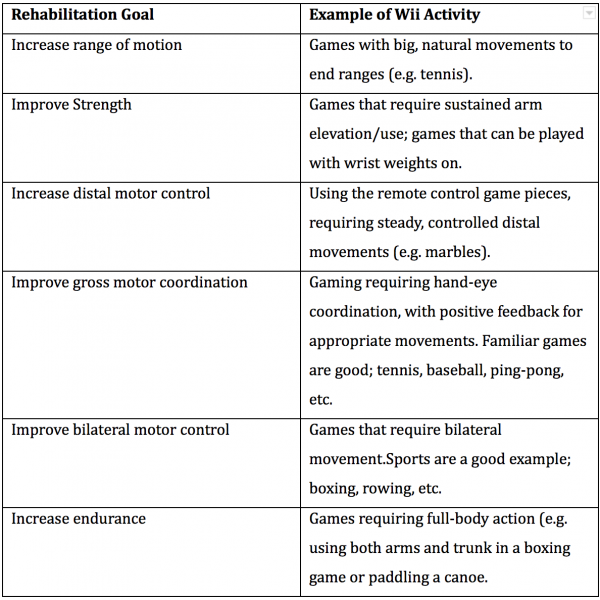 Increased use of the Wii for rehabilitation can be attributed to: versatility toward treatment goals, affordability, and increased engagement in therapy. Nintendo introduced a new style of VR by providing a wireless controller that interacts with the player through a motion detection system. 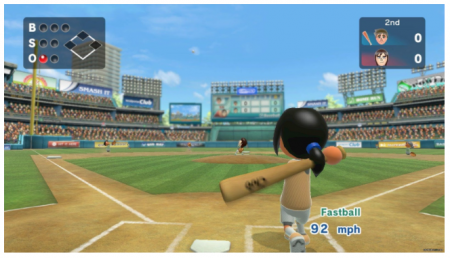 An avatar called Mii, (pronounced “me”) represents the player in the game. Initial interest in the Wii as a therapy tool for upper extremity rehabilitation was due to the console's’ unique wireless controller that allows games to respond to the physical movements of the player, rather than ‘joystick’ movements of traditional gaming systems Halton et al.. Movement is monitored by the components including the Wii remote, “nunchuk”, or balance board. Utilises a three-axis accelerometer to translate body movement into onscreen movement. Acceleration sensors are responsive to changes in direction, speed, and acceleration that enable participants to interact with games while performing wrist, arm, and hand movements. Provides basic audio and visual feedback. The nunchuk also incorporates motion-sensing technology and provides additional controls. The balance board has four pressure sensors to detect the player’s centre of gravity Taylor et al..
A two-point infrared light sensor, mounted on top of a television, captures and reproduces movements from the controller and depicts them as the avatar onto the screen Taylor et al.. The games offer immediate visual and audio feedback, as patients can observe their movements in real time as projected on screen. Patients may require assistance and supervision while using the Wii. Patients with increased seizure activity may be susceptible to seizure-inducing stimuli. Patients with pace-makers should keep the Wii remote at least 9 inches away from their chest. When conceptualising commercial gaming as a therapeutic tool, the benefits of using this technology to enhance existing therapy practice need to be clear. Wii games were found to improve UL motor function post-stroke. Saposnik et al. concluded, when compared to a recreational group therapy (playing cards, bingo, “Jenga”), post-stroke participants showed significant improvement in motor function up to six months post-intervention in the Wii group. A study by McNulty et al. of patients 2-46 months post-stroke found that Wii therapy was as effective as modified constraint-induced movement therapy for improving affected UL movement, and increased independence in activities of daily living. All patients in the Wii therapy group reported increased independence in self-care. A recent systematic review carried out by Thomson et al. highlights that although there is a trend towards improved UL function and movement, there is insufficient high quality evidence to reach a definitive conclusion about the benefits on activities of daily living or UL function and movement. Larger scale randomised control trials are now needed. There have been no studies showing a negative impact of commercial gaming on therapy. 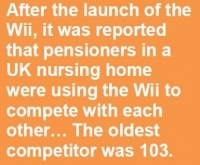 It is therefore likely that the Wii is used complementary to conventional therapy. Halton et al. found that the Wii may be too difficult for some patients because it requires a certain level of motor control to progress in the games. A more sensitive system could perhaps overcome these compensatory movements using sensors or vibration to feed back to the patient when they are compensating. However, a limited number of studies have adapted the Wii hardware to turn the Wii into a more useful rehabilitation tool. Matamoros et al. customised the Wii remote and nunchuk so that it could transmit physiological data such as grip strength and finger force while performing therapy. More research is needed in order to design Wii games with a more sensitive rehabilitation focus. Despite its emerging popularity, current research suggests that the Wii is not a suitable replacement for conventional therapy. Some studies found that Wii practice can lead to benefits on UL function, movement and ADL, but there is insufficient evidence to reach general conclusions. However, commercial gaming can provide high intensity UL practice that is safely tolerated for 180 minutes per week. Stroke rehabilitation is a complex area with gaps in the evidence base on how to promote motor recovery. Some interventions show promise; particularly studies that focus on high-intensity, repetitive task-specific practice. Nintendo Wii encourages high intensity of repetitive arm movements. Over time, patients might find the conventional task-specific exercises monotonous. 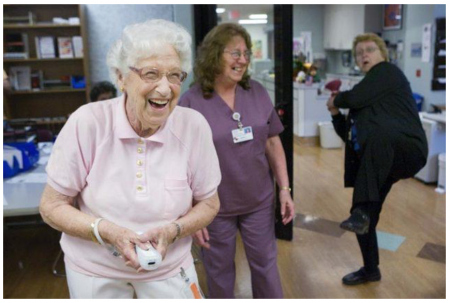 As discussed earlier, the Wii can potentially motivate patients to spend more time participating in active UL movement because of its fun and interactive approach. Therapists clearly play a key role in selecting and adapting games and activities to meet the needs of patients in the rehabilitation process. Although the evidence suggests some benefits of using the Wii console in UL rehabilitation, movements by patients playing the Wii are more complex than those in a conventional physiotherapy programme. This can interfere with tailoring a standard treatment plan for a patient because the patient will use different movements with various levels of force. How can we improve the sensitivity of Wii consoles and tailor games to different patient populations? How can we improve safety and usability issues for longer-term use at home? The therapist will pre-select games, taking into consideration an individual’s preferences, and UL functional capacity. Different games or parts of the game will be used for different patients. It is the therapist’s role to monitor for appropriate responses to the game, ensure correct muscles usage, and to be aware of fatigue or pain. The therapist can provide verbal encouragement, support the client’s hand with a cuff to hold the Wii remote if the patient’s grip is inadequate, or even provide hand-over-hand assistance or play with the patient. The Wii games described thus far are sold with the Wii console. Although they can be used to assist with rehabilitation goals, Wii games are not designed to do so. Therefore specifically designed games to compliment rehabilitation are needed. Games have been designed for patients with burns, diabetes, asthma, and bladder and bowel dysfunction. Future research should focus on designing more specific games that are suited to the needs of the patient in rehabilitation. The potential of the Wii may improve if games and accessories are designed with rehabilitation in mind. 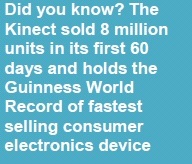 Kinect was released in 2010 and was held as breakthrough in gaming technology. No longer does the player need to hold a remote, instead cameras and motion capture sensors recognise the player and tracks their movement and displays it on the screen. Kinect began as a revolutionary game platform. It uses an infrared-depth sensing camera  manufactured by PrimeSense . The camera captures the users’ full-body movement in 3D space for gaming activities . PrimeSense is used in Microsoft Kinect . Microsoft Kinect sensor can be connected to PC through USB allowing data to be uploaded or downloaded from the server . Kinect enables users to control and interact with the game console by using gestures rather than game controllers , as the Kinect PrimeSense body sensors are not needed as they would in a lab setting . The game 20,000 leaks has the participant use their hands, feet, and head to side step or lunge to plug various leaks that are generated by fish or sharks crashing into a virtual glass bubble . The PrimeSense detects the players’ movements and provides feedback regarding the quality of movement thus determines if the player has succeeded in completing each task. The PrimeSense utilises a RGB camera and a depth sensor, the combination of these components provide full-body 3D motion capture . The Kinect One is reported to have a 1080p, HD camera that captures video at 30 frames per second . New active-infrared capabilities increase precision, allowing Kinect One to work in various lighting condition with an expanded field of view. Microsoft proprietary ‘Time-of-Flight’ technology measures the time it takes individual photons to rebound off of the player to create unprecedented accuracy and precision. The new noise-isolating multi-microphone array filters ambient sound to recognise natural speaking voices. The camera has greater sensitivity than its predecessors and is able to detect additional data points of articulation including the heartbeat of the player. Kinect is appropriate for individuals with a wide array of injuries and disorders . Patients can complete game-based tasks while standing or seated, allowing for greater accessibility to those with disability including wheelchair users. Kinect is commercially available allowing patients to self-manage and complete additional physiotherapy exercises at home. The Kinect will provide feedback on patient performance . 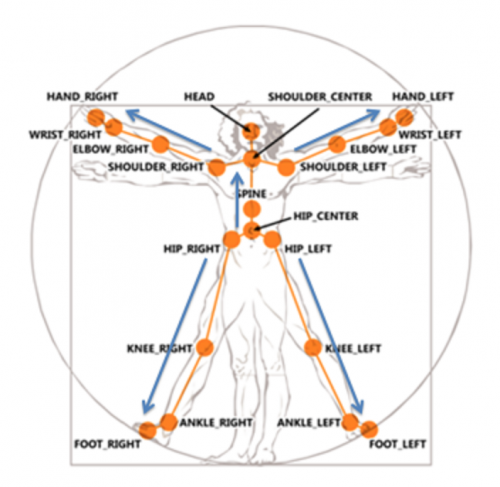 Kinect measures three degrees of freedom of the upper limb, one at the elbow and two at the shoulder. The system includes an interactive interface with audio and visual feedback to enhance motivation , interest, and perseverance to engage in physical activity. Players may not reach a sufficient rate of intensity to acquire sufficient improvements . The use of Kinect as an adjunct to traditional physiotherapy may be unknown to health care professionals . Patients have reported Kinect and physiotherapy designed protocols were well accepted, easy to use and safe for use in both home and clinical environments. ) No adverse events were reported during testing sessions conducted by Palacios-Navarro et al. who concluding that Kinect games are a safe and feasible means of rehabilitation. VGBT has also been recommended as a complementary strategy to conventional therapy for children with CP. Patents who were recovering from neurological injuries including stroke and spinal cord injuries found using a Kinect prototype to be a valuable rehabilitation tool. When using Kinect in the clinic the rehabilitation area needs to be clear with supervision present. An initial assessment should be conducted within the home environment to ensure the safety of the patient (HCPC Codes of conduct). The PT, carer and pt should review all exercises prior to commencing rehabilitation; the patient should have a carer present when appropriate. There is less risk associated with exercise performed seated when compared to those performed in standing, in populations that have impaired balance and coordination. The rapidly developing field of VR offers substantial promise in rehabilitation. The VR systems create interactive simulations. MIRA (Medical Interactive Recovery Assistant) has developed software that uses the Kinect interface. Their games aid health care professionals by providing data pertaining to patient performance . 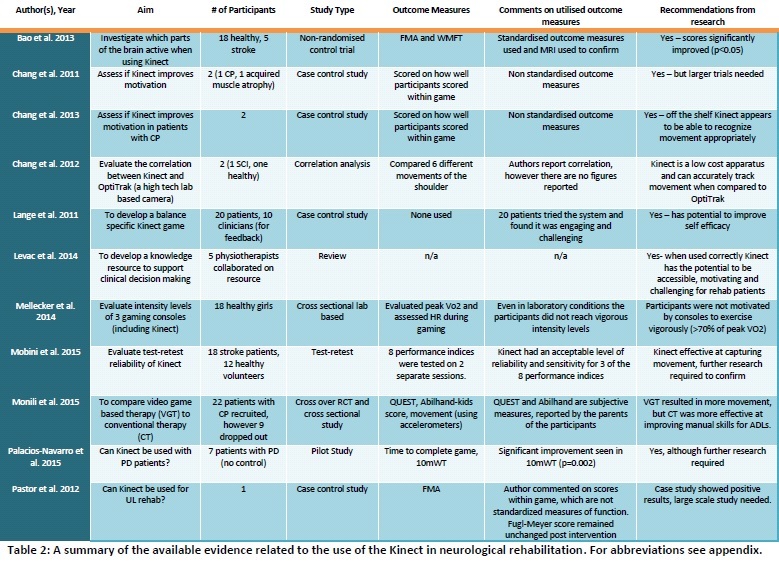 Kinect’s validity, reliability, and feasibility have been assessed in Table 3. Kinect is recommended by the current research as an appropriate addition to rehabilitation. Kinect has been found to have acceptable reliability and sensitivity in both recovering and healthy populations . Improvements to neuroplasticity and subsequent recovery of motor function following injury or disease to the nervous system is through intense skillful practice has been observed . MRI results indicate activation of the contralateral primary sensorimotor cortex was activated after Kinect-based training in stroke patients . Individuals with access to intensive multidisciplinary rehabilitation programs demonstrate earlier and faster gains on functional independent measures. This would suggest Kinect provides the required intensity needed to investigate neuroplastic changes in sub-acute stroke patients recovering from hemiplegia. Additionally, a large systematic review found the gains from VRBR are attributed to the multisensory feedback provided by the Kinect while influencing motivational aspects of motor performance. 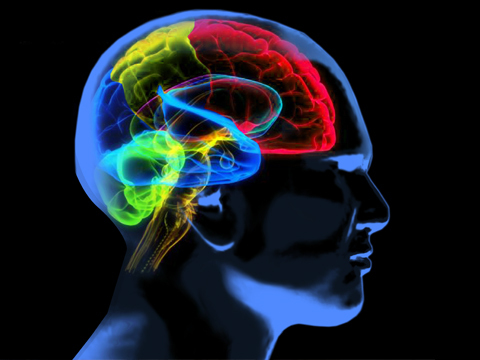 Sensory information allows the central nervous system to control body position and orientation allowing adaptations to complex external environments . Effects of VRBR were found to exist at one and three month’s follow-up within the study. Kinect's low-cost and easy-to-use characteristics make it suitable for the home environment . More research is required as sample sizes were small, some studies did not have control groups while others lacked follow-up. Due to Kinect’s unique interface, many software companies have been able to develop their own games to target specific clinical outcomes. For this reason, there have been a number of studies conducted without the use of any XBox games. This section will firstly outline some common XBox games used for rehabilitation with the latter section discusses rehabilitation specific software. Player uses arms, legs and head to block leaks in the glass bubble to prevent water from spilling into the bubble. This game requires trunk stability, movement of the upper limbs, lower limbs, trunk and head. The player must make purposeful movements to accurately block the leak. The player must side step, squat, flap and raise their arms to move around in outer space. They must hover around to pop bubbles and gain bonuses. The player requires trunk stability and adequate strength in the upper and lower limbs to engaged in hovering. Accuracy of upper limb movement is required as the targets are specific. With the use of the upper limb and head, the player must side step to hit a moving ball that hits a variety of targets. The positioning of the upper limbs is important to hit a specific target. It is equally important to engage the trunk musculature for stabilisation during these movements. A raft simulation that requires navigation by leaning forward and sideways as well as the use of the upper limbs to target bonuses while on the river. The player engages in jumping and side-stepping to avoid obstacles. Trunk and lower limb stability is required throughout the game. It is also important to have accurate upper limb movement and timing to gain bonuses. Player is situated on a rail cart that must avoid obstacles by bending and side-stepping. The upper limbs are used to collect bonuses. Arm movements do not require specific placement as the bonuses are larger scale and easier to obtain. The player must step side to side to act as a defender, kick the ball to act as offense and move side-to-side and lift their arms to act as the goalkeeper. For serving, the player must make an upward motion with one arm and a swing motion with the other. The play must also mimic the motions of bumping, setting and spiking the ball. 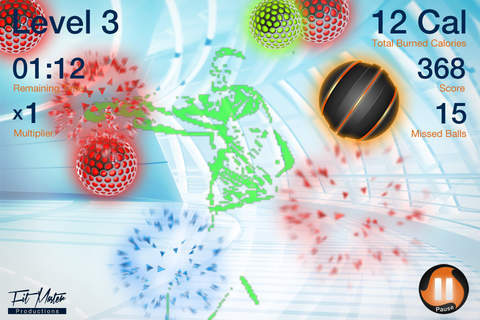 Requires the player to reach with their left or right arm to grab a ball and then to proceed to swing their arm forward in a bowling action, while maintaining their balance. Includes sprinting, javelin, long jump, discus, and hurdles. Players must jog on the spot, jump and use arm movements to throw the discus and javelin. 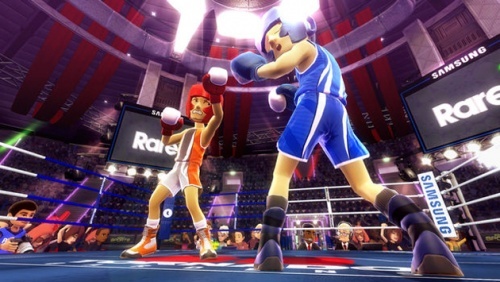 Player must use both of their arms to punch and block at various heights in response to visual stimuli. 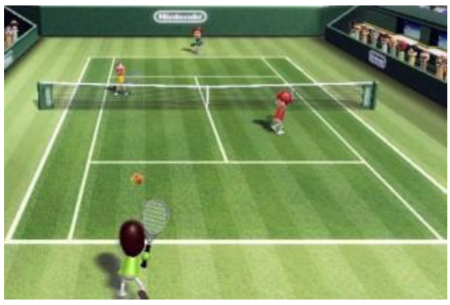 Players must reach to their left or right to grab the paddle and swing their arm forward to create topspin, backspin and smash shots. The game also has a “Paddle Panic” setting in which both arms can be used to hit as many balls as possible. A study by Zoccolillo et al. incorporated the games 20,000 Leaks, Space Pop, and Rally Ball (as well as the boxing, volleyball and bowling games in Kinect Sports package) with the rehabilitation of children with cerebral palsy. They found significant improvements in the quality of movement of the upper limbs, especially for grasping and dissociated movements. Using the arms as the “blades”, gamers must slice various sized fruit to collect points. This could include shoulder abduction, adduction, flexion, extension, and rotation. The game requires gross dexterity that is timed with the falling fruit. The game’s difficulty increases with more fruit falling at a faster rate. The gamer is positioned at the center of the action, therefore needing to use both arms to slice as many of the fruit falling on either side of them. A study by Bao et al. found that using fruit ninja with patients with subacute stroke for an hour, 5 times a week, improved scores on the Fugl-Meyer Assessment and Wolf Motor Function Test. Aims to improve range of motion, strength, coordination, activities of daily living, and cognition through enjoyable and engaging games. The games and exercises can be modified to engage the upper limbs, lower limbs, core, and/or back. The therapist is able to prescribe specific exercises to be included in the patient’s program. The system provides feedback within the game as well as therapist-selected biofeedback. After each session, a report is generated involving gait, balance, range of motion and motor control data. The therapist is able to review the report of the patient’s performance and generates a progress report to detect trends over time. The system is able to recognise individual patients. This enables the therapist to be in view of the camera without getting included in the virtual reality of the game. This feature also enables quick start up by recognising the patient and bringing up their specifications in the game. This system has implications for neurological musculoskeletal, connective tissue circulatory system, and respiratory system pathologies. MIRA involves engaging games aimed at rehabilitation of the upper limb. The system originated to help the rehabilitation of orthopaedic impairments and has now branched to involve neurological impairments. Primarily focussed on hemiparesis, tetraparesis, Parkinson’s disease, dystonia, autism and stroke. Upper limb movements of the shoulder (flexion, abduction, frontal plane rotation, internal and external rotation, and bilateral arm raises) are used to encourage the player and enable the achievement of treatment goals. These movements involve reflexes, upper limb coordination, flexibility, range of motion, posture, bilateral arm coordination, hand-eye coordination, reaching, and speed constrained movements. Aimed to improve coordination, balance, muscle strength, range of motion, reaction times, and memory. The games are easily modified to fit the treatment needs, defined as “deep customisation”. The system generates reports in real time to allow the therapist to analyse compensatory movements, relative angles between limbs, movement times, and range of motions. The reports also allow analysis and quantification of long-term progress. The developers state their target populations as those who have had a stroke, MS, CP, Parkinson’s disease, extrapyramidal syndromes, brain-tumour operations, spinal cord injury, muscular atrophy and a number of orthopaedic issues. Descriptions of modules are outlined on their website, allowing the therapist to select the appropriate games for their patient’s goals. There is also a real life module that enables the player to undergo activities of daily living in the virtual world. The developers have also introduced a number of games for at home use (with the use of a PC and webcam) that cost under 20 USD. A system that uses clinically devised exercises to engage patients in their rehabilitation. The system also measures outcomes in real-time and reports it to the clinician. This report enables the therapist to make adjustments to the therapy as well as challenge the patient to improve their scores. Currently, clinician must be monitoring the patient’s participation, not available commercially. The main focus of the system is for the rehabilitation of neurological conditions such as stroke and TBI. Is aimed at coaching and motivating patients to perform their exercises. The company is currently focused on musculoskeletal rehabilitation (joint replacement surgery and fall prevention) but has the potential to be used in a broader context, including neurological rehabilitation. Vera has recently received FDA clearance and will be used in a number of clinics as aid to rehabilitation. The system uses an avatar to engage the patient in prescribed exercises at home. The therapist is then able to review the results reported by the system and make adjustments to the program as needed. Was developed to assist therapists rehab students in a public school setting. The settings of the game can be adjusted to individualise the game to the student’s rehabilitation needs. The main purpose of the game is to enable students to gauge the accuracy of their movements during rehab. The system provides visual and audio feedback as well as records the student’s progress for the therapist to review. A pilot study involving two students with cerebral palsy found an improvement accuracy of upper limb movement. Also, the students reported enjoying the activity and that it promoted better engagement in their therapy regardless of the fact that this is not defined as a “game”. VOTA is a virtual reality program that enables participants to practice virtual activities of daily living (ADLs). It incorporates upper limb movements “within integrated, multi-step activities”. The participant manoeuvres around a virtual world and approaches ADLs. The upper limb movement is captured during the execution of the ADLs. This makes it possible to engage both motor and cognitive abilities. The participant is given visual and verbal cues. The system is not recommended for rehabilitating the lower limbs. A study of hemiparetic stroke patients showed a moderate correlation between the game-embedded assessment of the VOTA system and Wolf Motor Function Test (WMFT) time based assessments. Therefore the VOTA can potentially be used to track the participant's progress. A tablet computer more commonly referred to as a tablet, is a portable computre with a touchscreen display. While a traditional computre will have a seperate keyboard, mouse, screen and speakers a tablet combines all of these components into one. The touchscreen display reduces the mouse, and the tablet has a built in camera, speakers and battery. In an audit of current practices in rehabilitation of adults with cervical spine injuries Verdonck and Maye identified the increasingly important role that smartphones and tablets have in activities of daily living and interaction. They recommended that Occupational Therapists integrate smart technology into rehabilitation practices for patients with c-spine injury to allow patient’s greater autonomy. An Accelerometer: This detects physical movement and orientation of the device. This is used in gaming to allow the user to tilt the device in order to steer a car, for example. A Gyroscope: A gyroscope works alongside the accelerometer to calculate orientation and rotation. A device with both an accelerometer and a gyroscope will have greater accuracy at determining where the player’s hand is. This will therefore allow the tablet to produce a more accurate recording of the work completed. GPS (Global Positioning System): This can tell the user or another person where on the planet the tablet is, accurate to a few meters, providing that the tablet is connected to the internet. This can be useful at measuring distance walked or providing directions to guide a person back home or to the nearest bus stop, hospital or shop. A Camera: This could be used to communicate with the healthcare professional, or to record a patient’s rehab session for playback later. Tablets are portable and battery operated, which allows the patient to complete their rehabilitation remotely from the clinic. This feature also allows patients to begin using the tablet for rehabilitation in the hospital or clinic and continue the same program after discharge. Tablets are relatively cheap. The only piece of hardware needed is the tablet itself, there is no extra equipment needed. Anyone can develop a game or app for tablets, and release it on the ‘App Store’ for the iPad or 'Play Store’ for Android devices. When a game is released in these stores, anyone can download and start to use it within a matter of minutes. Patients with dysphasia can use the tablet to help them communicate. 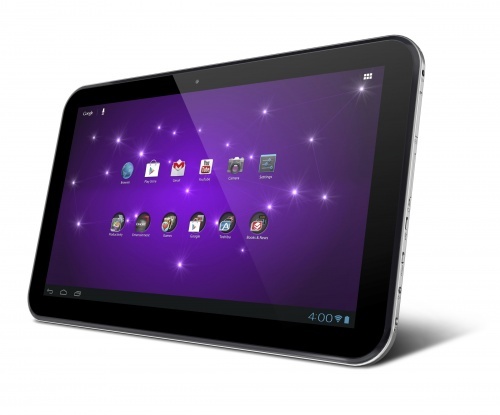 No assistance is required in setting up the tablet; the user can pick up the tablet and start to play immediately. This gives the patient a measure of independence and ownership over their rehab. Several of the games described below have a function that allows the therapist to set up an account and monitor their patients’ progress remotely. It can also be used to adjust the difficulty settings of games or to provide feedback or motivation via messages or even short video clips. While the tablet is very good at monitoring fine movement, which is important for improving dexterity at present, it is not useful for rehabilitating gross movements of the upper limb, except as a virtual coach. 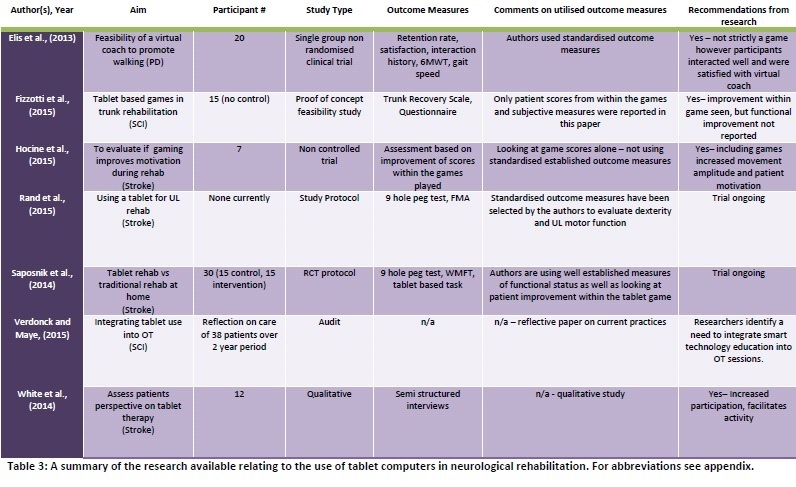 At present the evidence base supporting tablet use in rehabilitation is very limited. All of the studies that looked at patient response reported extremely positive feedback from the patients. Elis et al. reported that patients were highly satisfied with the intervention (rating it 5.6/7 on a Likhert scale). White et al. eported that patients were very satisfied with their tablet based home rehabilitation program, as they felt that their treatment was very modern and cutting-edge. Compliance was high across all studies. Participants enjoyed the gaming aspect to their treatment. Hocine et al. reported that participants perceived the sessions to be shorter than they were and one patient likened their game, Prehab to ‘Mario’. Age did not appear to influence how participants interacted with the tablet, nor did it appear to influence how participants scored in games. Both Fizzotti et al. and White et al. discussed how elderly patients might be adverse to using a computer or have difficulty adapting to the new technology as a potential barrier to its use. However this was found to be untrue with older participants scoring equally well to younger participants and stroke survivors adapting to the technology well with reassurance and education. The 2013 NICE guidelines for rehabilitation after stroke recommend repetitive task training for patients with motor deficits. On rehabilitation wards, physiotherapists often focus on working on gross movements and muscle groups key to maintaining a high a level of function for patients. Dexterity and fine motor skills can often be overlooked. The inclusion of tablet-based gaming has the potential to help with this. If a ward had several tablets preloaded with several rehabilitation games that patients could use either alone or with assistance from family members, they could safely work on hand movements and dexterity with or without assistance from the healthcare team. The same tablet could in theory also contain information about their condition, advice from members of the healthcare team (in written, audio or video format) and programs that help to combat communication problems post-stroke. The provision of a tablet could also help to bridge the gap between hospital and home, allowing patients to begin therapy in the ward, then take the tablet home and continue the same familiar therapy at home. Patients often feel abandoned and lonely when discharged from hospital and the need to tackle this has been identified. 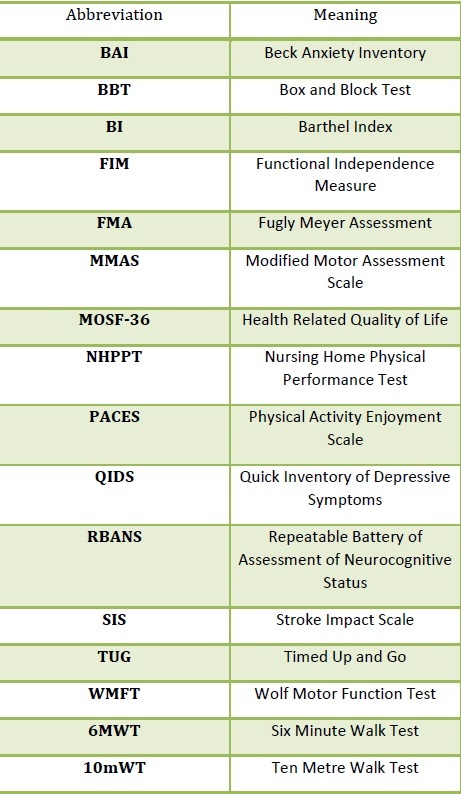 (NICE stroke rehab guidelines). Providing a tablet to improve continuity of care is one possible method that could be used to try and prevent patients from feeling isolated on hospital discharge. Unlike a traditional computer where computer programs are bought on CD Rom, on a tablet applications (commonly referred to as apps) are bought on the ‘App Store’ or ‘Play Store’, an icon that is already on the screen of the tablet when purchased. 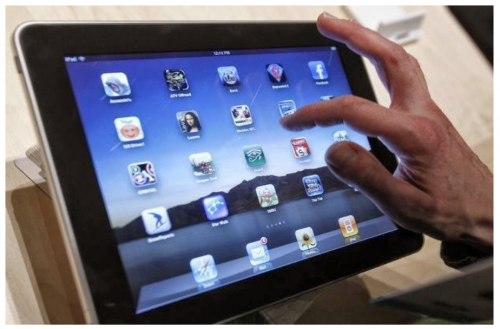 The tablet user clicks on the icon called ‘App Store’ on an iPad or ‘Play Store’ on an Android device, and types in the name of the app that they wish to download. Below are some examples of available games that have a rehabilitation focus, however this list is not exhaustive. An android-based game that utilises an avatar to navigate through a world, defeat enemies and collect bonuses. This game requires gross movements of the upper limb to complete the actions of lifting (up and down) and transporting (left and right). The therapist is able to personalise parameters such as the avatar’s speed, the enemy's’ speed, the size of the world, and the directions that the player will need to move. These modifications allow the therapist to change the game’s difficulty based on the patient’s abilities. For example, increasing the size of the world would require increased magnitude of gross movements. The therapist is also able to log into a web server to track their patient’s data, the game settings, and a list of stats from different sessions (i.e. levels played, scores, the date and time, the number of bonuses counted and the number of enemies hit on different position in the level). This can be used to ensure adherence to the therapy and to quantify where the patient may be struggling. A pilot study on five MS patients showed good compliance and high enjoyment and engagement with the game. Ball Strike: an iPad game where the player’s image is projected into the game. The objective of this game is to hit moving colour balls and avoid grey balls. This action engages the trunk, upper limbs, head and shoulders. As the player progresses through the levels of the game, the difficulty increases. The level in which the patient can go to can be manipulated by the therapist. An iPad game where the player’s image is projected into the game. The player must blow soap bubbles and avoid hitting bombs, rockets, knives etc. This action requires dynamic trunk balance, selectivity, and speed of movement. A study by Fizzotti et al. on spinal cord injury patients showed significant in game scores and subsequent improvement in Trunk Recovery Scale, which is an indication of trunk control. There was also improved self-reported trunk control and increased satisfaction of treatment. Android and iPad based game. Requires goal oriented hand movements to “slice” fruit as it appears on the screen. The player must also avoid missing more than three fruit or slicing a bomb, as this will end the game. Khademi et al. manipulated the game to get rid of the bombs and the three fruit rule and instead use a one-minute time limit. This resulted in a high correlation between the game’s score with Fugl-Meyer Assessment (FMA) and Box-and-Block Test (BBT). Stroke patients were able to increase their scores in the game throughout the study, which resulted in increased FMA and BBT scores. An app that provides therapeutic hand exercises. Dexteria specifically indicates that it is not a game, while their children friendly app “Dexteria Jr.” has games to enable the children to engage in therapeutic hand exercises. The exercises aim to improve strength, control and dexterity in the hands and fingers. Parent’s and therapist are able to track progress with the in-app automatic tracking and reporting feature. Rand et al. found a strong correlation between the Dexteria scores and the Nine Hole Peg Test and with the Box-and-Block Test. Android-based game that uses household and work-related activities to engage the player in finger tapping, dragging and stretching exercises. The aim is to improve finger control, isolation and coordination, and range of motion. The difficulty of the game increases with each level achieved. Carabeo et al. found improved dexterity in a small group of stroke patients. The patients also felt that the game was effective and enjoyed it. It was also reported as being more engaging than standard physiotherapy. Prehab (or Platform games for Rehabilitation) is a game designed for use on a tablet intended for upper-arm rehabilitation through tasks such as reaching and pointing. The player enters a virtual world where they must collect coins, avoid detection by the enemy and find a gemstone to protect Nature. It has several different settings, for example an underwater environment where the main character is a turtle, a forest and a desert. Each environment is equally challenging, although all of the participants in Hocine et al. study preferred the underwater interface, perceiving it to be easier and more adaptive to the player, which merits further investigation. Stroke Rehab was designed by Saposnik et al.. for their ongoing study and is specifically designed for patients with fine motor weakness of the upper limb and/or neglect. It consists of six stages of incremental difficulty and involves moving, popping and stretching balloons that appear on the screen either as stationary items or moving around the screen. . Since 2007, the Wii and the Balance Board have been used by numerous practitioners (primarily physiotherapists) in the rehabilitation of amputees, cerebral palsy therapy, scoliosis midline re-training, and balance retraining in the elderly. A survey  distributed to occupational therapists and physiotherapists within acute stroke units, rehabilitation units, and community teams within Scottish Health Boards found that the most commonly used commercial gaming device is still the Wii with the Wii Sports package. They also found that 18% of therapists use commercial gaming devices for UL rehab, with 81% of the other therapists indicating an interest in using gaming for UL rehab if it was available. The authors of the survey concluded by explaining that a successful gaming program needs to address the need of self-practice models to increase time spent with rehabilitation. Feeling a bit overwhelmed by all of the information and research? 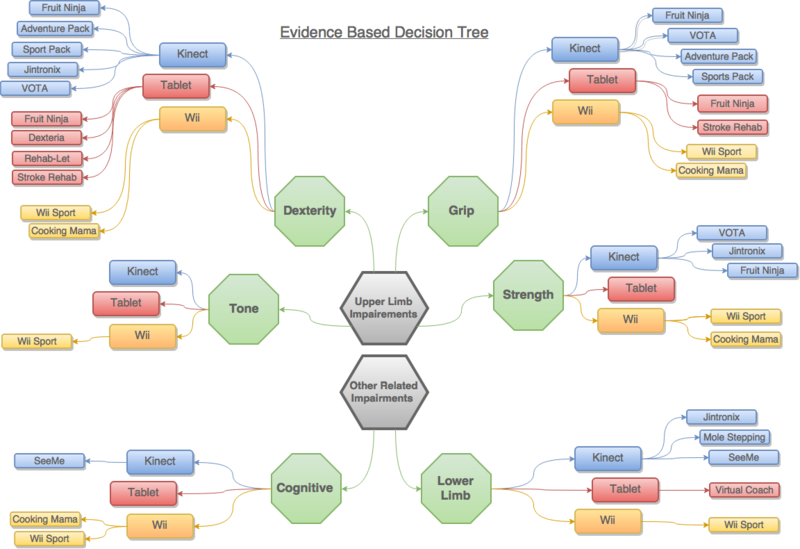 We’ve included a decision tree to help you decide what is best for your patients. This tree strictly includes the games that have reported sufficient research and have demonstrated improvements in their respective impairment. This has no implication on the quality of the games not included in this diagram; the evidence was just not sufficient at the time of the development of this wiki. Please refer back to the “Games” sections to make an informed decision. The following table outlines the outcome measures used for categorising each subheading in the “Decision Tree”. It also outlines which outcome measures can be used with specific games. Current research indicates that the use of virtual reality as an adjunct to traditional rehabilitation in neurological patients is promising. Consoles and tablets are commercially available, affordable and safe to use making them a feasible option to supplement rehabilitation of neurological conditions. The variety of games available for the different systems make VR ideal for the vast number of neurological conditions as it will not only cater to specific parts of the body, it is engaging to its audience both young and elderly. Console based rehabilitation does not seek to replace therapists with computers; rather it is a useful tool that therapists can use as an adjunct to make rehabilitation engaging, thus improving compliance rates to improve the overall functional outcome of patients. The pairing of consoles with traditional therapy is an economically beneficial approach to ensuring optimal rehabilitation of neurological patients. This is particularly important, as neurological pathologies require long periods of rehabilitation with large amounts of repetition. These factors also address barriers including reduced motivation, due to the mundane nature of repetition. More research is needed in the area of VR in rehabilitation as the data to date consists mainly of small sample groups with a poor use of outcome measures. It would be beneficial to have an increase in longitudinal studies with larger population samples to determine the long-term implications of VR on rehabilitation. Greater use of control groups would also benefit the area, though in some instances there would be ethical considerations to contend with. Additional follow up studies would also improve the robustness of data gathered, providing therapists with a clear picture of the benefits obtained in using VR within the rehabilitation process. More information is needed regarding the optimum prescription in terms of hours per week to reach neuroplasticity. Additionally, there is a lack of data comparing and contrasting the various systems commercially available. There is also a lack of data available pertaining specifically to individuals with disability with few studies discussing how VR may be used with patients that are blind, deaf or wheelchair bound. The future of rehabilitation is moving toward incorporating VR into therapy. As technology continues to advance, the use of tablets in rehabilitation will grow. This will be ideal due to the portable interactive nature of these devices. Additionally, as the blending of tablets and smartphones continue, individuals everywhere will essentially be able to undergo activities of daily living with a rehabilitation assistant in their pocket. Studies have examined video gaming as an intervention to various impairments including: balance, mobility, cognition, and upper extremity function. Video game therapy is an emerging area for neurorehabilitation, and recent research has shown that the effectiveness of gaming for upper limb neurological rehabilitation is promising. ↑ 1.0 1.1 1.2 Audit Scotland. A review of telehelath in Scotland. 2011. Available from: http://www.audit-scotland.gov.uk/uploads/docs/report/2011/nr_111013_telehealth.pdf [Accessed 12th November 2015]. ↑ Fager SK, Burnfileld, JM. Patients’ experiences with technology during inpatient rehabilitation: opportunities to support independence and therapeutic engagement. Disability and Rehabilitation: Assistive Technology. 2014 9(2):121-127. ↑ 4.0 4.1 Fager SK, Burnfileld, JM. Patients’ experiences with technology during inpatient rehabilitation: opportunities to support independence and therapeutic engagement. Disability and Rehabilitation: Assistive Technology. 2014 9(2):121-127. ↑ 5.0 5.1 5.2 5.3 Deutsch JE, Borbely M, Filler J, Huhn K, Guarrera-Bowlby P. Use of a low-cost, commercially available gaming console (Wii) for rehabilitation of an adolescent with cerebral palsy. Journal of the American Physical Therapy Association. 2008; 88: 1196-1207. ↑ 6.0 6.1 Lam MY, Tatla SK, Lohse KR, Shirzad N, Hoens AM, Miller KJ, Holsti L, Virji-Babul N, Van der Loos, M. Perception of technology and its use for therapeutic application for individuals with hemiparesis: findings from adult and pediatric focus groups. JRAT. 2015 2(1):1-13. ↑ 7.0 7.1 Brown SH, Lewis CA, McCarthy JM, Doyle ST, Hurvitz. The effects of internet-based home training on upper limb function in adults with cerebral palsy. Neurorehabilitation and Neural Repair. 2010; 24(6):575-583. ↑ Deutsch JE, Borbely M, Filler J, Huhn K, Guarrera-Bowlby P. Use of a low-cost, commercially available gaming console (Wii) for rehabilitation of an adolescent with cerebral palsy. Journal of the American Physical Therapy Association. 2008; 88: 1196-1207. ↑ Sluijs EM, Kok GJ, van der Zee J. Correlates of exercise compliance in physical therapy. Physical Therapy. 1993; 73 (11):771-786. ↑ 15.00 15.01 15.02 15.03 15.04 15.05 15.06 15.07 15.08 15.09 15.10 15.11 15.12 15.13 15.14 Umphred DA (ed). Neurological Rehabilitation. Fifth Edition. St. Louis, Missouri: MOSBY Elsevier; 2007. ↑ 17.0 17.1 17.2 17.3 17.4 Joo LY, Yin TS, Xu D, Thia E, Chia PF, Kuah CWK, He KK. A feasibility study using interactive commercial off-the-shelf computer gaming in upper limb rehabilitation in patients after stroke. Journal of Rehabilitation Medicine. 2010; 42:437-441. ↑ 18.0 18.1 18.2 18.3 18.4 18.5 18.6 Taylor MJD, McCormick D, Shawis T, Impson R, Griffin M. Activity-promoting gaming systems in exercise and rehabilitation. Journal of Rehabilitation Research and Development. 2011; 48(10):1171-1186. ↑ Nintendo News. 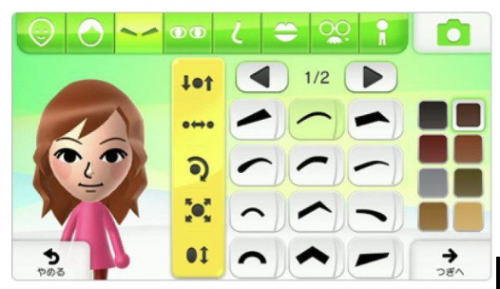 Mii. 2012. Available from:http://mynintendonews.com/tag/mii/ [Accessed 17th November 2015]. ↑ 20.0 20.1 20.2 20.3 20.4 Halton J. Rehabilitation with the Nintendo Wii: Experiences at the rehabilitation hospital. Occupational Therapy Now. 2010; 12(3):11-13. ↑ BBC. 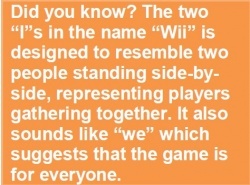 Factfile:The Wii.2006. [viewed 01 November 2015]. Available from:http://news.bbc.co.uk/1/hi/technology/6155664.stm [Accessed 1st November 2015]. ↑ 23.0 23.1 23.2 23.3 Tatla S, Shirzad N, Lohse K, Virji-Babul N, Hoens AM, Holsti L, LI L, Miller K, Lam M, Loos M. Therapists’ perceptions of social media and video game technologies in upper limb rehabiltiation. JMIR Serious Games. 2015; 3:1-14. ↑ Fung V, So K, Park E. The utility of a video game system in rehabilitation of burn and nonburn patients: a survey among occupational therapy and physiotherapy practitioners. Journal of Burn Care and Research. 2010; 31:768-75. ↑ 25.0 25.1 25.2 25.3 25.4 McNulty PA, Thompson-Butel A, Faux SG, Lin G, Katrak PH, Harris L, Ssiner CT. The efficacy of Wii-based movement therapy for upper limb rehabilitation in the chronic poststroke period: a randomised controlled trial. International Journal of Stroke. 2015; 10(8):1253-1260. ↑ 26.0 26.1 26.2 26.3 Thomson K, Pollock A, Bugge C, Brady M, Commercial gaming devices for stroke upper limb rehabilitation: a systematic review. International Journal of Stroke. 2014; 9:479-488. ↑ Tatla S, Shirzad N, Lohse K, Virji-Babul N, Hoens AM, Holsti L, LI L, Miller K, Lam M, Loos M. Therapists’ perceptions of social media and video game technologies in upper limb rehabiltiation. JMIR Serious Games. 2015; 3:1-14. ↑ 28.0 28.1 28.2 Chao YY, Scherer YK, Montgomery CA. Effects of using Nintendo Wii exergames in older adults: a review of the literature. Journal of Aging and Health. 2014; 23:379-402. ↑ Sparks D, Chase D, Coughlin L. Wii have a problem: A review of self-reported Wii related injuries. Inform Prim Care. 2009;17(1):55–57. ↑ Saponik G, Chow CM, Gladstone D, Cheung D, Braer E, Thorpe KE, Saldanha A, Dang A, Bayley M, Schweizer TA. iPad technology for home rehabilitation after stroke (iHOME): a proof‐of‐concept randomized trial. International Journal of Stroke. 2014; 9(7):956-962. ↑ 31.0 31.1 31.2 31.3 Saposnik G, Teasell R, Hall J, McIlroy W, Cheung D, Thorpe KE, Cohen L, Bayley M. Effectiveness of virtual reality using Wii gaming technology in stroke rehabilitation. Stroke. 2014; 41:1477-1484. ↑ 32.0 32.1 Henry A, Barrett A, Wi-habilitation. Royal College of Surgeons in Ireland Student Medical Journal. 2010; 3:70-74. ↑ Matamoros M, Negrete M, Leder M. Nintendo Wii remote and nunchuk as a wireless data subsystem for digital acquisition of analog physiological data relevant to motor rehabilitation after stroke. Virtual Rehabilitation International Conference. 2009. ↑ 35.0 35.1 35.2 35.3 35.4 35.5 35.6 35.7 35.8 Lange B, Chang C, Suma E, Newman B, Rizzo A, Bolas M. Development and evaluation of low cost game-based balance rehabilitation tool using the Microsoft Kinect sensor. 33rd Annual international conference of IEEE EMBS Online. Boston Massachusetts USA. 2011;1831-1834. Available from: http://www.ncbi.nlm.nih.gov/pubmed/22254685 [Accessed 7th November 2015]. ↑ 36.0 36.1 36.2 36.3 36.4 36.5 36.6 36.7 36.8 36.9 Bao X, Mao Y, Lin Q, Chen S, LI L, Cates R, Zhou S, Huang D. Mechanism of Kinect-based virtual reality training for motor functional recovery of upper limbs after subacute stroke. Neural regeneration research. 2013; 4:2904-2913 Available: http://www.ncbi.nlm.nih.gov/pmc/articles/PMC4146174/ [Accessed 25th September 2015]. ↑ 37.0 37.1 37.2 37.3 37.4 37.5 Chang Y, Han W, and Tsai Y. A kinect-based upper limb rehabilitation system to assist people with cerebral palsy. Research in Developmental Disabilities. 2013; 34; 3654-3659. 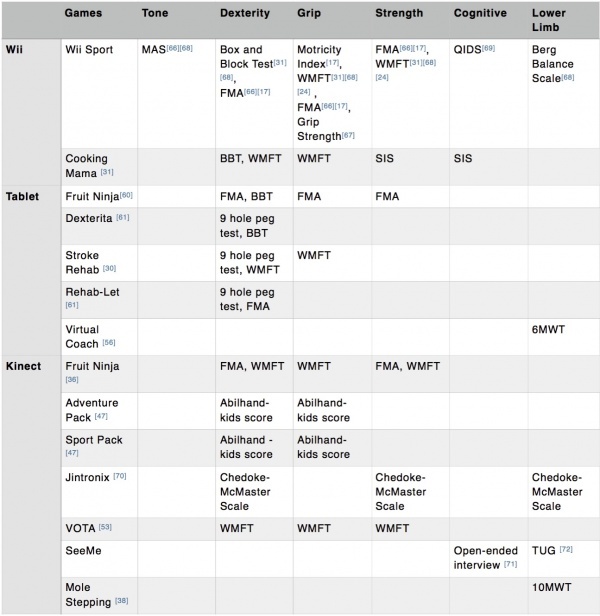 ↑ 39.0 39.1 39.2 39.3 39.4 39.5 Levac, D, Espy D, Fox E, Pradhan S, Deutsch J. Kinect-ing with clinicians: a knowledge translation resource to support decision making about video game use in rehabilitation. Physical Therapy. 2015; 95(3):426-440. Available from: http://www.ncbi.nlm.nih.gov/pubmed/25256741 [Accessed 29th October 2015]. ↑ Munro D. Microsoft’s new ‘Xbox One’ can measure heart rate. Forbes-Tech. 21st May 2013 Available from: http://www.forbes.com/sites/danmunro/2013/05/21/microsofts-new-xbox-one-can-measure-heart-rate/ [Accessed 16th November 2015]. ↑ 42.0 42.1 42.2 42.3 42.4 42.5 42.6 Mobini A, Behzadipour S, Saadat M. Test-retest reliability of kinect’s measurements for the evaluation of upper body recovery of stroke patients. BioMed Central. 2015. 14 . Available from: http://www.biomedical-engineering-online.com/content/14/1/75/ [Accesssed 23rd September 2015]. ↑ Doctor Kinetic. Doctor Kinetic. Available from: http://doctorkinetic.com [Accessed 8th November 2015]. ↑ MIRA Rehab Limited. MIRA Rehab. MIRA. Available from: http://www.mirarehab.com [Accessed 8th November 2015]. ↑ Brontes Processing. SeeMe Rehabilitation. Available from: http://www.virtual-reality-rehabilitation.com/products/seeme/what-is-seeme [Accessed 8th November 2015]. ↑ Reflexion Health. Reflexion Health-Vera. Available from: http://reflexionhealth.com [Acessed 8th November 2015]. ↑ Adams RJ, Lichter MD, Krepkovich ET, Ellington A, White M, Diamond PT. Assessing upper extremity motor function in practice of virtual activities of daily living. IEEE Transactions on Neural Systems and Rehabilitation Engineering. 2015; 23(2); 287-296. ↑ Verdonck M, Maye F. Enhancing occupational performance in the virtual context using smart technology. British Journal of Occupational Therapy. 2015; 1-6. ↑ 55.0 55.1 55.2 55.3 55.4 White J, Janssen H, Jordan L, Pollack M. Tablet technology during stroke recovery: a survivor’s perspective. Disability and Rehabilitation. 2015; 37(13):1186-1192. ↑ 56.0 56.1 Ellis T, Latham NK, DeAngelis TR, Thoms CA, Saint-Hilaire M, Bickmore T. Feasibility of a virtual exercise coach to promote walking in community- dwelling persons with Parkinson disease. American Journal of Physical Medicine & Rehabilitation. 2013; 92(6):472-485. ↑ 57.0 57.1 57.2 57.3 Fizzotti G, Rognoni C, Imarisoio A, Meneghini A, Pistarini C Quaglini S. Tablet technology for rehabilitation after spinal cord injury: a proof-of-concept. Studies in Health Technology and Informatics. 2014; 210:479-483. ↑ 58.0 58.1 58.2 Hocine N, Gouaaich A, Cerri SA, Mottet D, Froger J, Laffont I, Adaptation in serious games for upper-limb rehabilitation: an approach to improve training outcomes. User Modeling and User-Adapted Interaction. 2015; 25(1):65-98. ↑ 61.0 61.1 Rand D, Schejter-Margalit T, Dudkiewicz I, Kizony R, Zeilig G. The use of the iPad for poststroke hand rehabilitation; a pilot study. IEEE(2013). DOI: 978-1-4799-0774-8.13. pp. 109- 113. ↑ Carabeo CGG, Dalida CMM, Padilla EMZ, Rodrigo MMT. Stroke patient rehabilitation: a pilot study of an android-based game. Simulation; Gaming(2014). Vol. 45, no. 2. pp. 151-166. ↑ Flynn J. Applying gaming technology to healthcare student education. 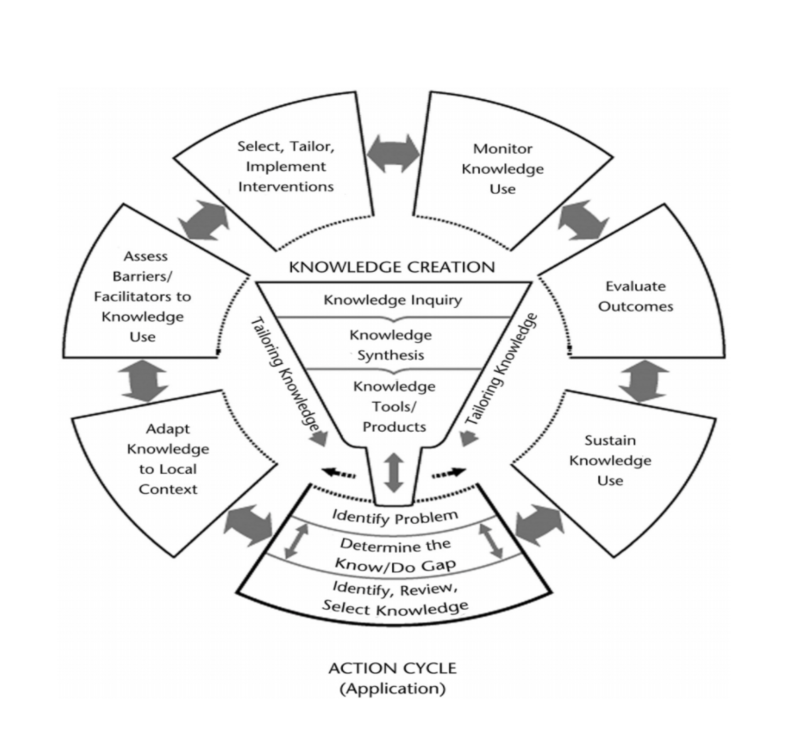 In: Game to learn: bringing education to life, 2010, University of Abertay, Dundee, Scotland. (Unpublished) 2010. Available at: http://eprints.hud.ac.uk/19810/ [Accessed 13th November 2015]. ↑ Thomson K, Pollock A, Bugge C, Brady M. The use of commercial gaming devices for stroke upper limb rehabilitation: a survey of current practice. Nursing, Midwifery and Allied Health Professions Research Unit. Glasgow Caledonian University, UK; 2014, DOI:10.13140/2.1.4270.4640. 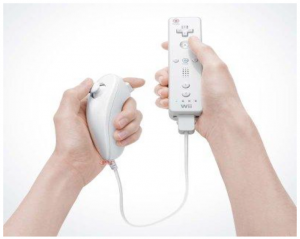 ↑ Manlapaz DG, Silverio L, Ang M. Effectiveness of using nintendo wii in rehabilitation of chronic stroke patients with upper limb hemiparesis: a pilot study. Univ St Tomas Coll Rehabil Sci Phys Ther DepfckLR2009; 1:1–41. ↑ Mouawad M, Doust CG, Max M, McNulty P. Wii-based movement therapy to promote improved upper extremity function post-stroke: a pilot study. Journal of Rehabilitative Medicine. 2011; 43(6):527-533. ↑ Rosenberg D, Depp CA, Vahia IV, Reichstadt J, Palmer BW, Kerr J, Jeste DV. Exergames for subsyndromal depression in older adults: a pilot study of a novel intervention. The American Journal of Geriatric Psychiatry. 2010; 18:221-226. ↑ Archambault P, Norouzi-Gheidari N, Tao G, Soloman JM, Kairy D, Levin MF. Use of exergames for upper extremity rehabilitation in stroke patients. 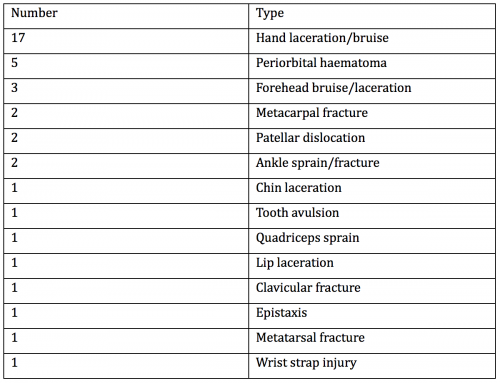 Annals of Physical and Rehabilitation Medicine. 2015; 58s: e103-e107. ↑ Sugarman H, Weisel-Eichler A, Burstin A, and Brown R. Use of novel virtual reality system for the assessment and treatment of unilateral spatial neglect: a feasibility study. International Conference on Virtual Rehabilitation. 2011. ↑ Lauder Y, Korsensky O, Brown R, Burstin A, and Hutzler Y. Rapid stepping time on “virtual” objects correlates with measures of balance and fear of falling in elderly individuals. Physiotherapy Journal Impact Factor and Information. 2015; 101.